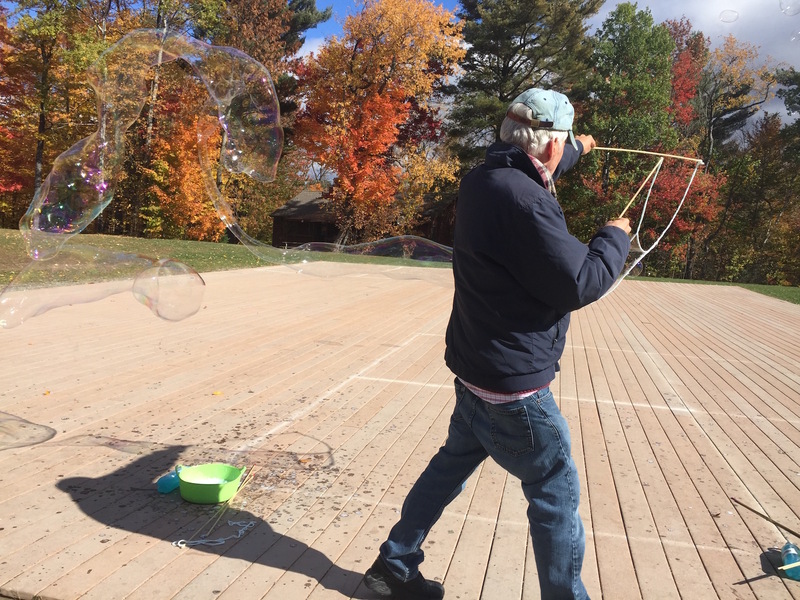 I learned how to make Mega Bubbles from my friend Mark Galipeau. Here's my version of the instructions. To get fully set up with everything you need, it's going to run around $100 in tools and supplies. If you already have a precision scale, the total will be more like $75. Once you're set up, though, the supplies will last a long time. HEC is the real magic ingredient, because it gives the bubbles their strength. Price: $24.95 for a 1-pound bag. This is one of the more expensive items, but 1-pound bag will last you a while. Lotioncrafter sells ingredients to people who like to make their own homemade lotions and other personal care products. The next several items can also be bought at Lotioncrafter. Citric Acid is a common ingredient in foods to add tartness. 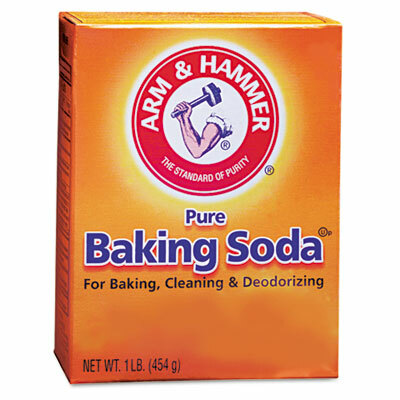 I'm not a chemist, but I'm told that the citric acid (together with the baking soda, below) helps control the pH. This helps the HEC to disperse evenly and not all clump up into one big jellyfish blob. 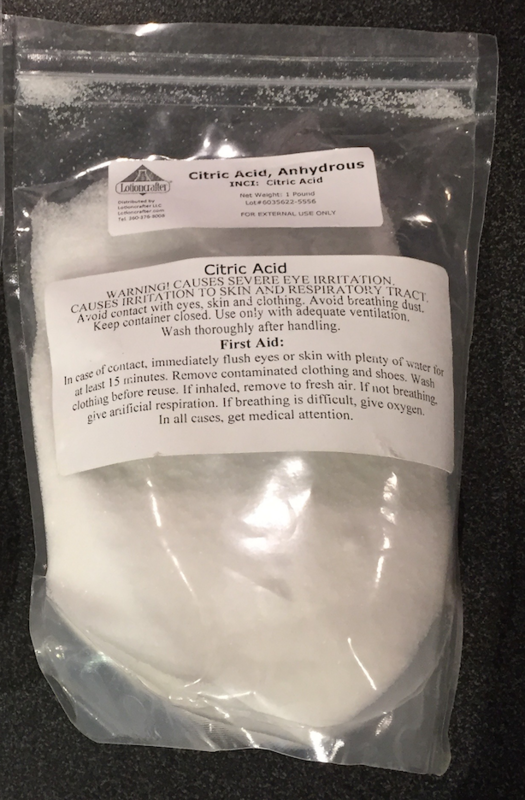 You can sometimes find Citric Acid in a regular grocery store sold as "sour salt", but read the ingredients to make sure there aren't other things added. Price: $3.95 for a 1-pound bag, which is a good supply. Any precision scale will do. 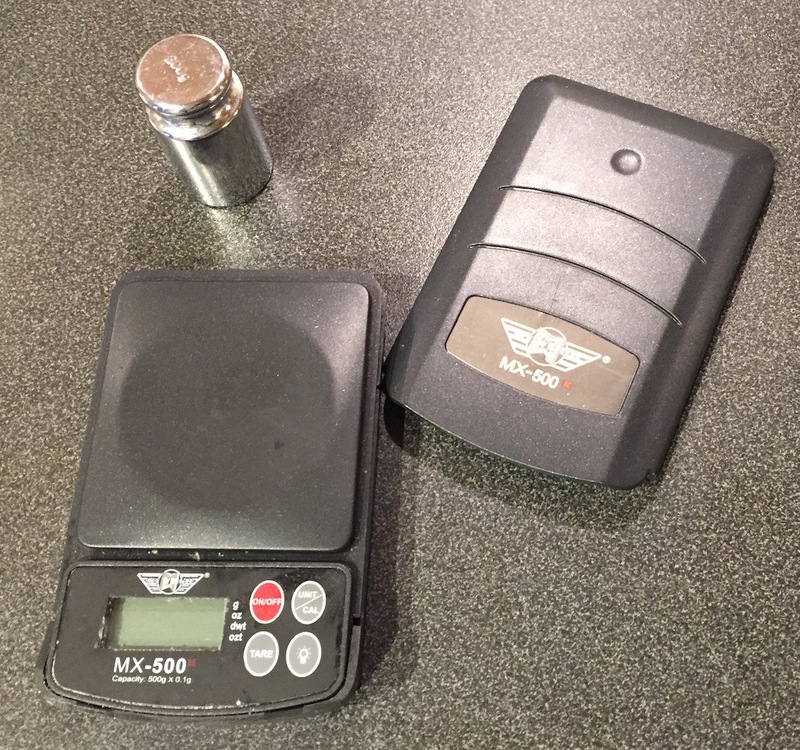 You want to be able to measure out the dry ingredients to an accuracy of tenths of a gram. I use a My Weigh MX-500. If you buy this one, also get the 200g calibration weight. These are really handy to use together with the precision scale for weighing out the dry ingredients. The kind of cord you use really does make a difference in how well the bubbles turn out. A good choice is Wright's 100% Polyester Cord (rectangular spool of 75 yards). The part number on the product is 1446060030, and a bar code of 0 70659 55035 5. Where to order it: I'd go to Google Shopping and search for it. I've heard you can get it at JoAnne Fabrics, but I don't know if this info is current. Click here for a close-up of the label. This is the main soapy ingredient in the bubbles. Like the citric acid, the baking soda helps the HEC to disperse evenly in the water and not all clump up into one useless blob. These don't have to be any specific length or width. 35” long and 3/8” thick (like a pencil) are good dimensions. To hold the strings together to the wands. They do dry out and perish after a while, so I write a date on the package so that I don't get old and new mixed up in my bubble supplies. Any old pans or bowls will do. 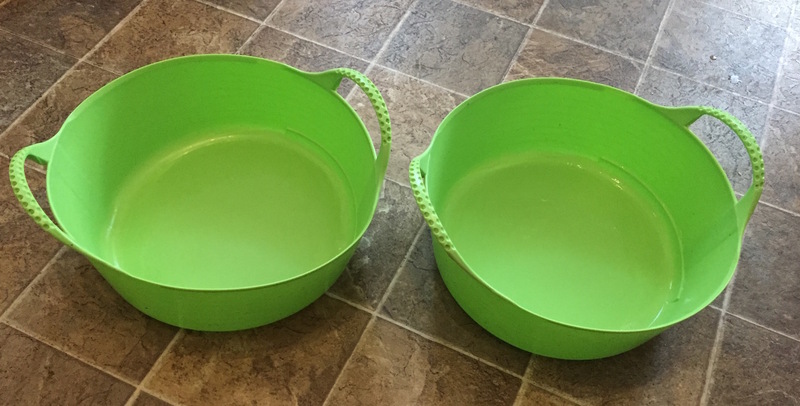 I think the ones I bought are sold as dog food pans. Tiny zip-lock plastic bags, if you're making small starter packs of the powder to give away. A good size is 2”×2”. 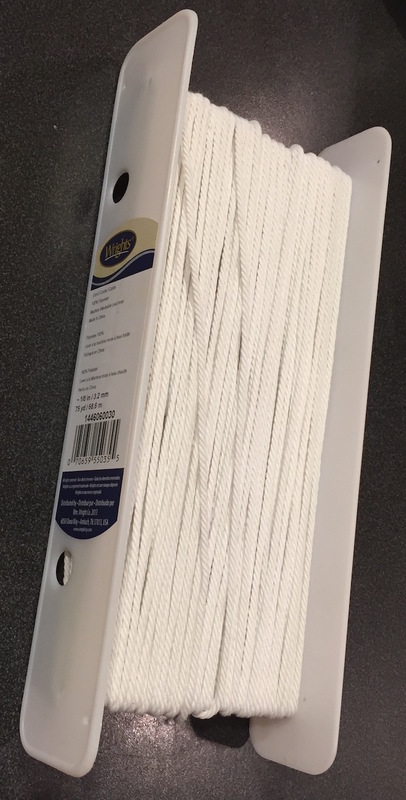 These can be ordered from TAP Plastics, 100 for $3.25. (Search the site for "zip lock bags"). Desiccant packs (the little tiny "do not eat" silica packs used to keep products dry). When I've given starter packs to people, they sometimes keep it for a year or more, and the powder sometimes clumps up, possibly meaning that the citric acid and baking soda have reacted and are no longer as effective. I bought a pack of 100 desiccant packs online to see if they help avoid this. 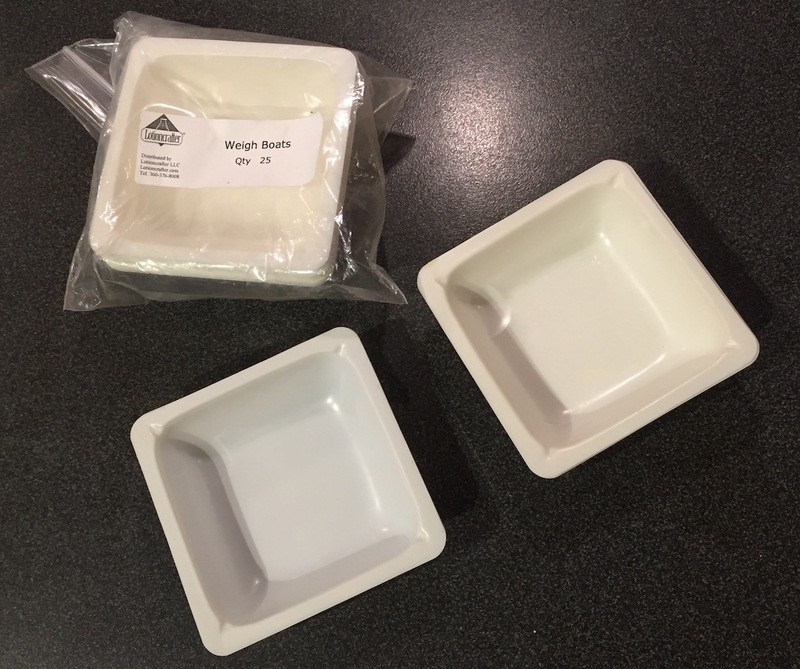 Make sure that the recipient of the starter pack knows to throw away the desiccant pack and not add it to the bubble solution. Wire whisk and/or electric hand mixer, to mix the powder with the water. Something to mix up the bubble solution in. I use a great big tall Dutch Oven, partly because it's a convenient way to heat the water some on the stove. Mark Galipeau suggests a 10-liter mop bucket from a dollar store. You can use a Sharpie pen to mark the 10-liter mark. Empty plastic bottles to put the bubble solution in. I rinse out empty 1-liter beverage bottles. Small funnel to pour the bubble solution into the bottles. If you're making a lot at one time time, here are sample amounts. 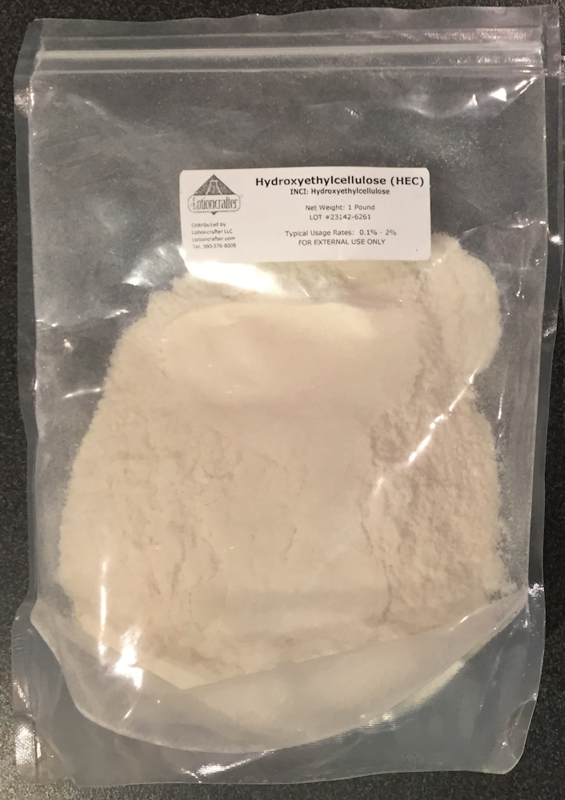 25g of powder roughly fills up one of the plastic measuring boats, so a convenient way to do this is to actually fill 3 boats with HEC, 2 boats with citric acid, and 1 boat with baking soda, so that you don't lose count. Don't mix up too much powder at a time. If you leave the powder sitting for a many months, it will absorb moisture and cake up. I don't know how badly this will affect the quality of the bubbles, but I imagine the the baking soda will react with the citric acid and probably not do as good a job of keeping the HEC dispersed in the water. If anyone knows the chemistry better than I do and can give better information here, please let me know. Dawn Ultra ⅓ c. ⅔ c. 1⅔ c.
Pick a container which will hold more than the quantity of water. Put the measured hot water in the container. You can use hot tap water, but I think the HEC will tend to clump up less if you heat the water on the stove until it's hot to the touch (not boiling). Add the mixed powder. Stir or shake until the powder is fully dissolved, and the solution is clear. Let the solution stand for at least 2 hours before using. The solution is best if left to sit overnight. Measure the water into a large Dutch Oven, and heat it up on the stove until it is hot to the touch, but not boiling. Turn off the heat. Add the mixed powder. Mix with a wire whisk; or better, use an electric hand mixer. Thoroughly mix until the solution is clear. Let the mixture cool. Go back periodically and whisk it more to make sure the HEC isn't clumping up at the bottom. If the HEC does start to clump up, and it's not too far gone, you can usually get it to dissolve again by mixing the solution thoroughly. 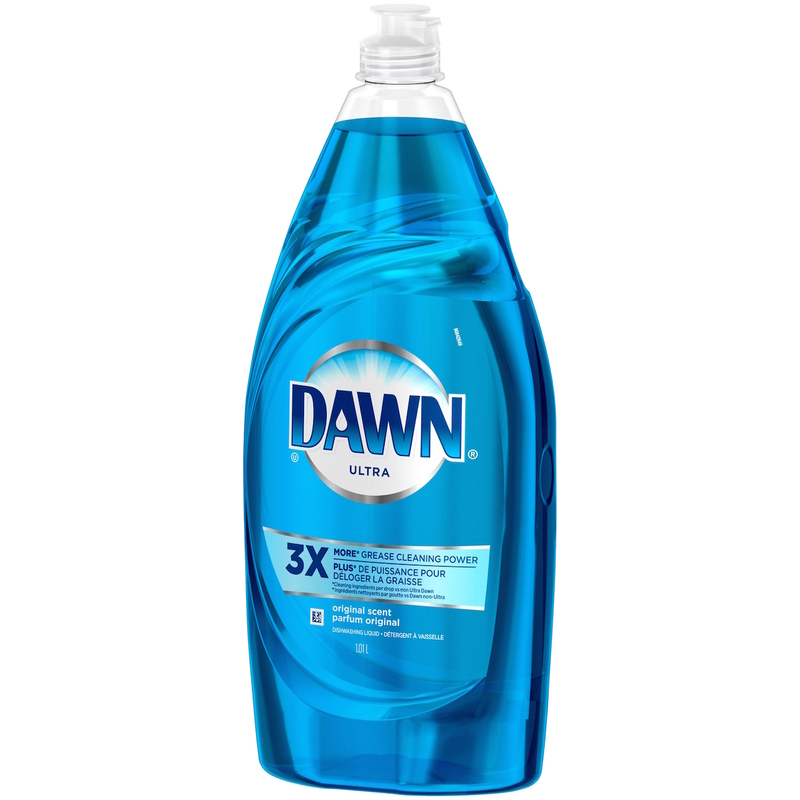 When cool, add the Dawn Ultra. Mix thoroughly, but stir gently to avoid creating lots of bubble foam. 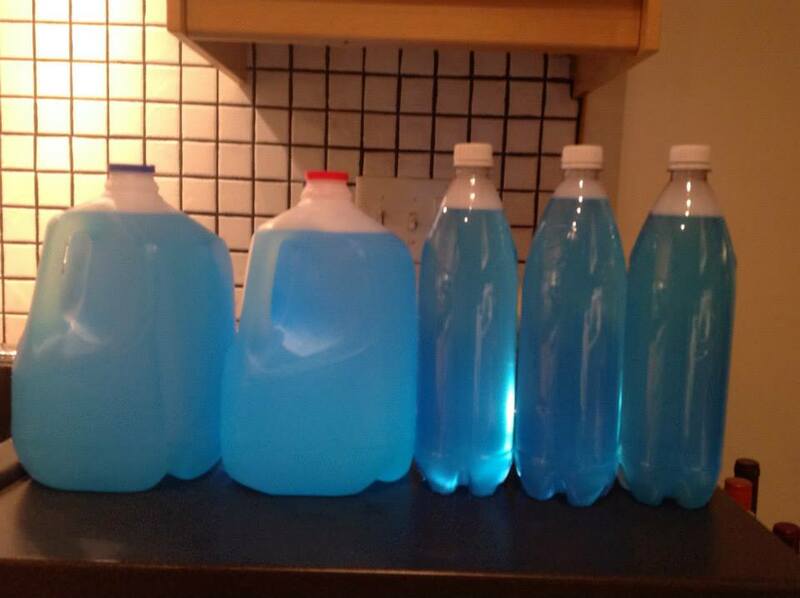 Use a ladle and funnel to pour the solution into empty plastic bottles. Let the solution stand for at least two hours before using. The solution is best if left to sit overnight. I've let it sit over the winter before (in the basement, not frozen), and it's still good in the spring, although you usually have to shake it to get the partially-separated HEC to disperse evenly again. Cut a piece of cord maybe 8 feet long. 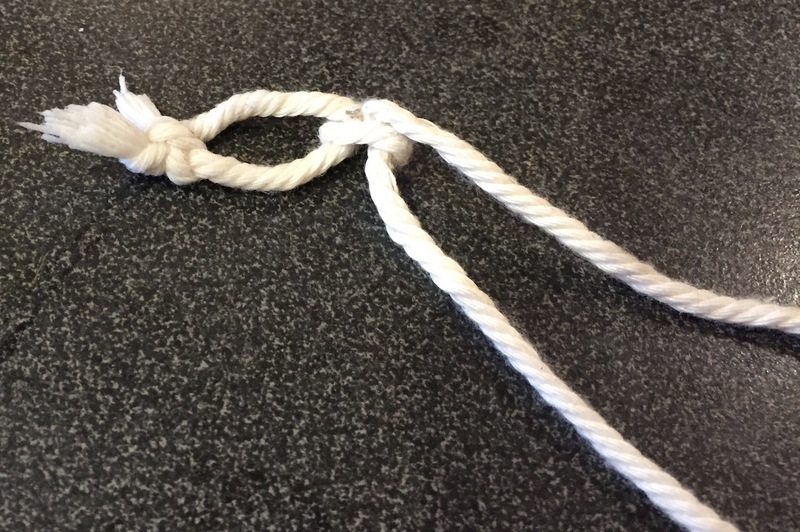 Tie knots in two places. 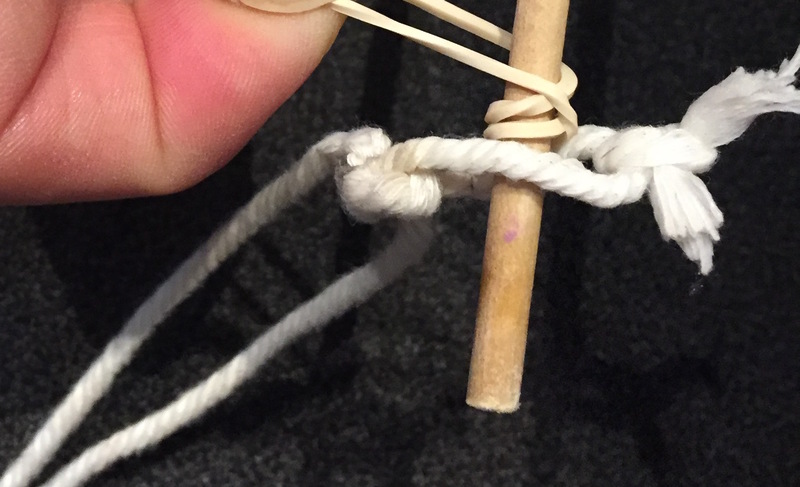 You want one edge of the loop to be a lot longer than the other (maybe ⅓ and ⅔ of the full length), so that the cord makes a smile-shape when you hold the wands apart. If you make the two edges the same length, there won't be any opening for the bubbles. 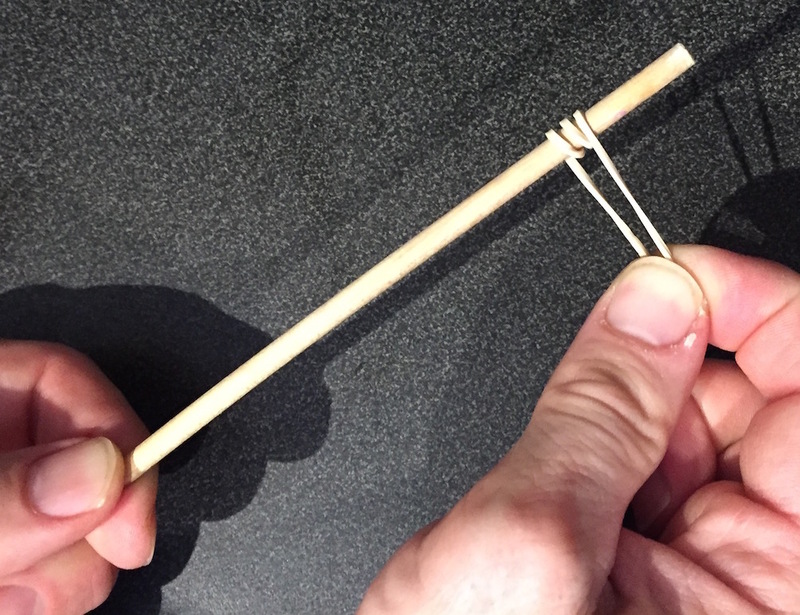 Here's how to attach the string to the dowels. 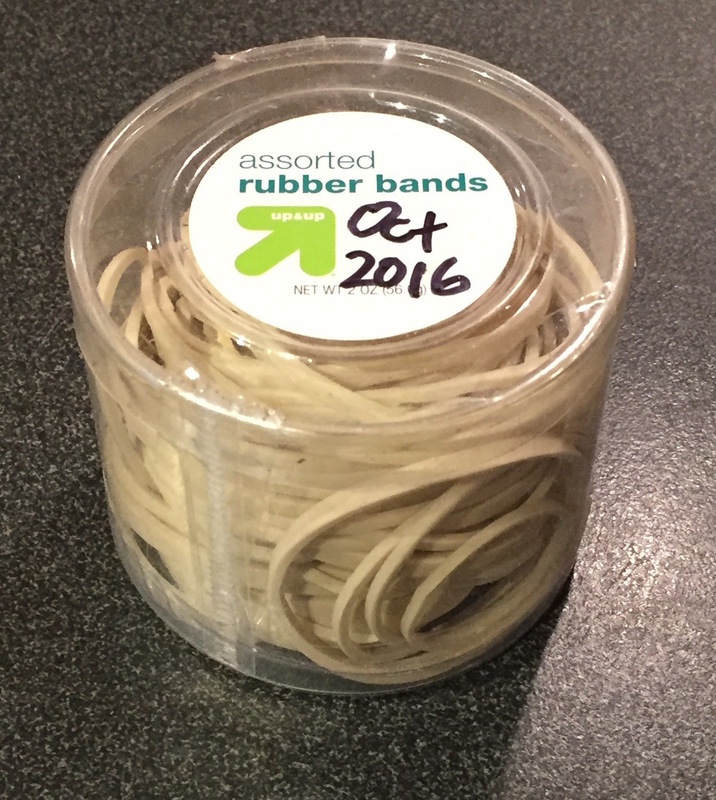 Twist a rubber band several times around the dowel. Slip the ring in the cord over the dowel. 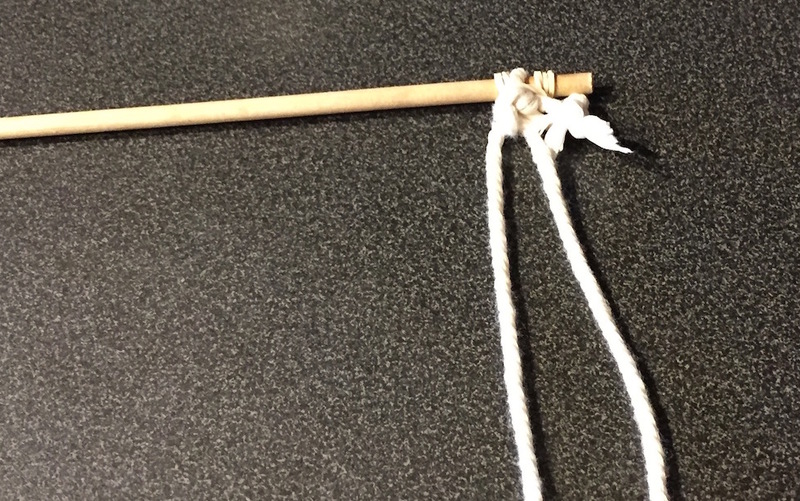 Wrap the rubber band around the dowel several times on the other side of the cord. Don't place the cord too far away from the end of the wands, or the end of the dowel will be in the way and will prevent the cord from dipping all the way down into a shallow pan of the bubble solution. 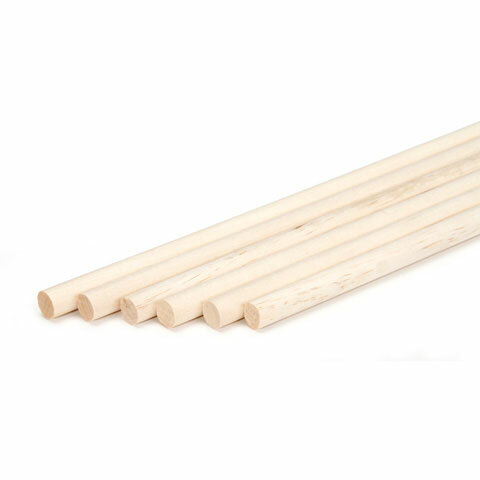 If you have some vinyl tape in different colors, you can color-code the non-string (hand) ends of the dowels to help the pairs from getting jumbled up. Dip the strings in the pan holding the solution. Hold the stick tips together as you lift the wands into the air. 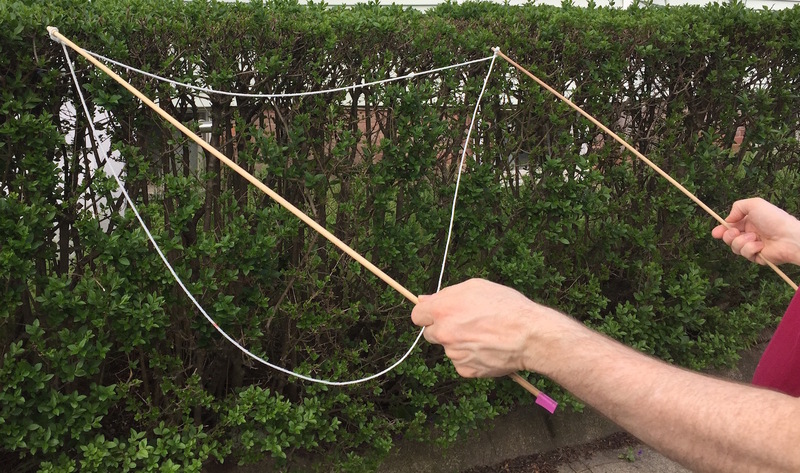 Slowly pull the sticks apart and let the air create a bubble and put the sticks together to close off and create a single bubble. 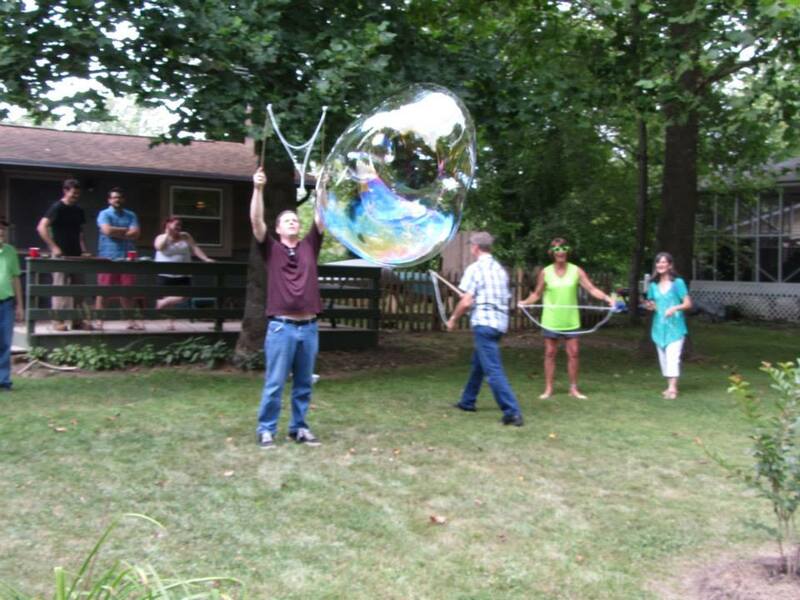 If there is no breeze you will need to walk backwards to fill the bubble with air. When the bubble is big enough for you, close the ends of the sticks. The best day for bubbles is a cool, humid day with a light wind. On a hot dry day, the bubbles evaporate too fast and don't form as well or last as long. If you stand beneath a bubble and blow on it, you can sometimes create a bubble within a bubble. 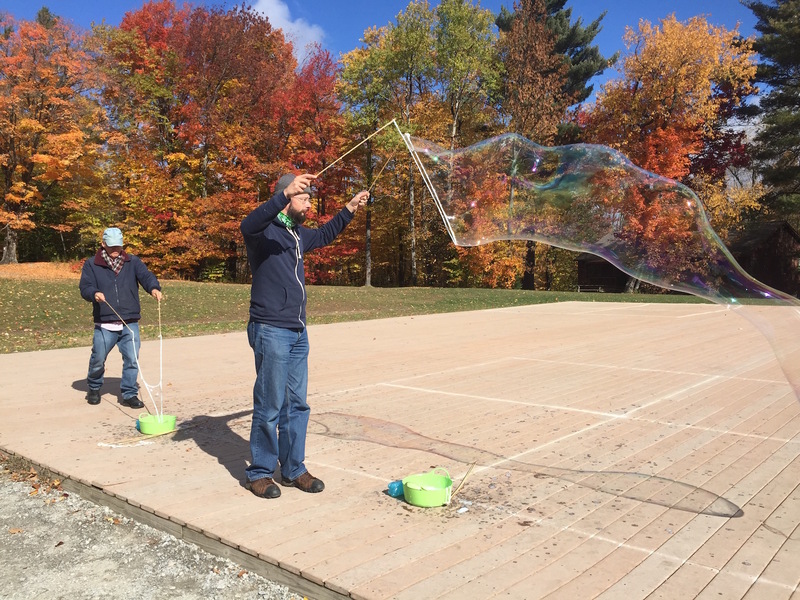 Kids love bubbles, but if the kids are small, someone will need to supervise. Small kids (toddlers through first grade, maybe) will put their hands and feet into the bubble solution pan, dump out the whole pan, all try to wet the cords at the same time and create a tangle, etc. A good way to manage traffic is to draw a chalk circle around the pan, and make a rule that you can't go inside the circle unless you have a pair of the wands. Kids love to pop the bubbles, so you may need to tell them they have to stand a little downwind so that they don't pop the bubbles before they've even left the wands. 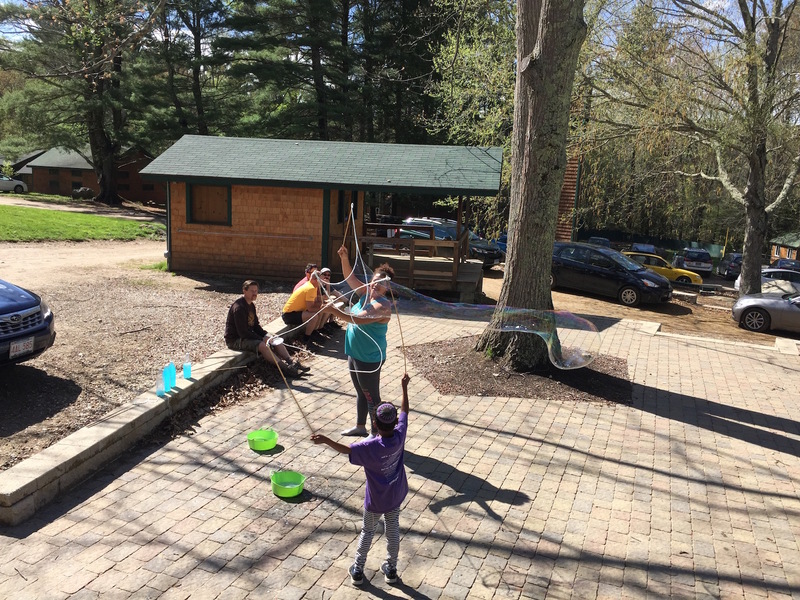 The older kids (maybe 5th grade) are little scientists and will carefully and deliberately experiment with forming good bubbles. It's great to see them thoughtfully concentrating on what they're doing.